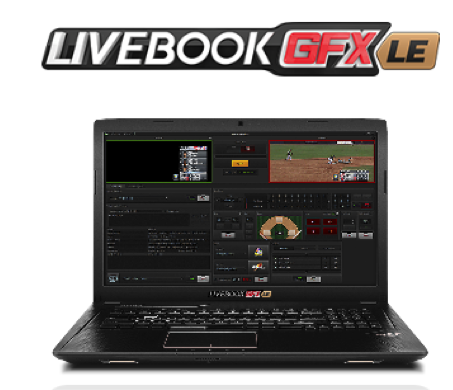 AJT Systems (SL9406) will be unveiling the new LiveBook GFX LE and LiveBook GFX NDI tiers at NAB 2017, with prices starting as low as $4,999! This new offering is sure to disrupt the market, as it is the most feature-rich, high-end solution available at this price point. Both LiveBook GFX versions work exclusively over NewTek’s NDI IP video with top of the line full motion graphics capabilities, and the ability to access our new online AJT Graphics Library – containing ready for air graphics (unpack and on air in the same day!) pre-approved for network broadcasts on OTT Networks, College Conferences, and a growing array of Sports Leagues. All LiveBook GFX systems ship with access to download full-HD animated, rebrandable sports graphic templates from the new AJT Graphics Library, developed by our award-winning graphic designers. These high-end stock templates mean clients can start broadcasting out of the box without having to create their own graphics packages. All LiveBook GFX systems also have download access to our approved-for-air OTT graphics and network branding for broadcasts on networks such as ESPN3, American Sports Network, Time Warner Cable, and American Digital Network. These new LiveBook GFX solutions are the most cost effective way to broadcast high end graphics packages such as those for ESPN3. Along with the new LiveBook GFX NDI and LiveBook GFX LE tiers, AJT Systems will also be debuting new features and SportApps at NAB 2017. Be sure to come by Booth# SL9406 in the South Lower Hall for a live demo of the new Hockey SportApp, and exciting features such as Roster Integration, Player Driven Data, and a new built-in Optical Character Recognition (OCR) clock that takes minutes to set up!